Ares I-X was the first-stage prototype and design concept demonstrator in the Ares I program, a launch system for human spaceflight developed by the United States space agency, NASA. 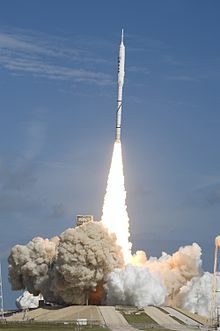 Ares I-X was successfully launched on October 28, 2009. The project cost was $445 million. Two minutes after launch, the Ares I-X's expended Solid Rocket Booster (SRB) first stage was detached from the unpowered Upper Stage Simulator (USS); both landed in the Atlantic Ocean at different locations, as planned. Quantifying the effectiveness of the first-stage booster deceleration motors. Characterizing induced environments and loads on the vehicle during ascent. Demonstrating a procedure for determining the vehicle's position to orient the flight control system. Characterize induced loads on the Flight Test Vehicle while on the launch pad. Assess potential Ares I access locations in the VAB and on the Pad. Assess First Stage electrical umbilical performance. The Ares I-X flight profile closely approximated the flight conditions that the Ares I would expect to experience through Mach 4.5, at an altitude of about 130,000 feet (39,600 m) and through a maximum dynamic pressure (“Max Q”) of approximately 800 pounds per square foot (38 kPa). The Ares I-X flight profile resembled the uncrewed Saturn I flights of the 1960s, which tested the Saturn propulsion concept. By flying the vehicle through first-stage separation, the test flight also verified the performance and dynamics of the Ares I solid rocket booster in a “single stick” arrangement, which is different from the solid rocket booster's then-current “double-booster” configuration alongside the external tank on the space shuttle. Rollout of Ares I-X at Kennedy Space Center Launch Complex 39 secured by four bolts on a mobile launcher platform. The Ares I–X vehicle consisted of a functional four-segment solid rocket booster (SRB) stage, a fifth segment mass simulator, an upper-stage simulator (USS), which was similar in shape and heavier than the actual upper stage, as well as a simulated Orion crew module (CM) and launch abort system (LAS). Since the actual upper-stage hardware could not be produced in time for the flight test, the upper-stage mass simulator allowed the booster to fly approximately the same trajectory through the first stage of flight. The USS and the CM/LAS mass simulators launched by the Ares I-X were not recovered and fell into the Atlantic Ocean. The first stage, including the fifth segment mass simulator, was recovered to retrieve flight data recorders and reusable equipment. The aft skirt was modified to include eight booster deceleration motors, which pulled the booster directly away from the upper-stage simulator, as well as four booster tumble motors, which caused the booster to tumble horizontally to decrease its velocity prior to reentry. The aft skirt also housed one of two Redundant Rate Gyro Units (RRGUs), which provided data to inform the Fault Tolerant Inertial Navigation Unit (FTINU) of the vehicle's attitude and position. Steel ballast of 3,500 pounds (1,589 kg) was also added to the aft skirt to move the first stages center of gravity aft to ensure that the first stage would tumble properly after separation. An extended linear shaped charge for the flight termination system, to cover all four segments in the event the stage needed to be self-destructed. Cabling for additional pressure and environmental instrumentation. Captured and stored flight data for recovery after splashdown. Provided electrical power for the avionics systems. Performed separation and parachute deployment commands. Contained video cameras that record the first-stage separation. A hollow forward skirt which simulated the Ares I First Stage forward skirt. A forward skirt extension, which housed new, larger parachutes. The three main parachutes each had a 150-foot (46 m) diameter, compared to the Shuttle booster main parachutes, which are 136 feet (41 m) across. It also had a Shuttle booster heritage nosecap that covers the pilot and drogue parachutes. Jettisoning the nosecap released the pilot parachute which pulled out the drogue. The forward skirt extension separated from the booster deploying the main parachutes. A frustum, which was a hollow, inverted half-cone that connected the 12-foot (3.7 m)-diameter first stage to the 18-foot (5.5 m)-diameter upper-stage simulator. For the Ares I-X flight test, the frustum and forward skirt extension were made of aluminum. The forward skirt and fifth segment simulator were made of steel. The upper-stage simulator (USS) was manufactured by NASA personnel at Glenn Research Center in Cleveland. Because of transportation limitations (bridge heights on highways and rivers), the simulator was built out of eleven steel segments 9.5 feet (2.9 m) tall by 18 feet (5.5 m) wide. The USS simulated the shape, mass, and center of gravity characteristics of Ares I from the interstage to the top of the service module of the Orion Crew exploration vehicle. The centers of mass for the liquid hydrogen and liquid oxygen tanks were simulated through the use of steel ballast plates. The USS included a variety of temperature, vibration, thermal, and acoustic sensors to collect the primary data needed to meet the mission objectives. It also housed the Fault Tolerant Inertial Navigation Unit (FTINU), which controlled the vehicle's flight and primary avionics functions. For stability, the FTINU was mounted on the underside of the lower ballast plates. Ground operations personnel accessed the FTINU through a crew hatch on the side of the interstage segment, which also housed the roll control system. Each USS segment included a ladder and ring-shaped platform to allow access to the sensors and cabling for the developmental flight instrumentation. The stairs and platforms were necessary because Launch Complex 39B is not tall enough to provide crew access to the upper parts of Ares I-X. Rolling the vehicle 90 degrees after liftoff to emulate the Ares I roll attitude at launch. Maintaining a constant roll attitude during ascent up to stage separation. The RoCS modules, placed on opposite sides of the outer skin of the Upper Stage Simulator, used hypergolic monomethyl hydrazine (MMH) and nitrogen tetroxide (NTO) for propellants and each included two nozzles, which fired tangential to the skin and at right angles to the roll axis in order to provide a controlling roll torque. The propellants were loaded into the modules at Kennedy Space Center's Hypergol Maintenance Facility (HMF) and transported on the ground for installation into the USS in the Vehicle Assembly Building (VAB) prior to rollout to Launch Complex 39B. The RoCS modules were designed and constructed to fit into the Interstage segment of the USS by Teledyne Brown Engineering in Huntsville, Alabama. The engines were hot-fire tested at White Sands Test Facility in 2007 and 2008 to verify that they could perform the pulsing duty cycle required by Ares I-X. At the top of the Ares I-X flight test vehicle was a combined Orion crew module and launch abort system simulator, resembling the structural and aerodynamic characteristics of Ares I. The full-scale crew module (CM) is approximately 16 feet (5 m) in diameter and 7 feet (2.1 m) tall, while the launch abort system (LAS) is 46 feet (14 m) long. The CM/LAS simulator was built with high fidelity to ensure that its hardware components accurately reflect the shape and physical properties of the models used in computer analyses and wind tunnel tests. This precision enables NASA to compare CM/LAS flight performance with preflight predictions with high confidence. The CM/LAS simulator also helps verify analysis tools and techniques needed to further develop Ares I.
Ares I-X flight data were collected with sensors throughout the vehicle, including approximately 150 sensors in the CM/LAS simulator that recorded thermal, aerodynamic, acoustic, vibration and other data. Data were transmitted to the ground via telemetry and also stored in the First Stage Avionics Module (FSAM), located in the empty fifth segment. Aerodynamic data collected from sensors in the CM/LAS contribute to measurements of vehicle acceleration and angle of attack. How the tip of the rocket slices through the atmosphere is important because that determines the flow of air over the entire vehicle. The CM/LAS splashed down in the ocean along with the upper-stage simulator (USS) after the boost phase of the mission. This simulator was designed and built by a government-industry team at Langley Research Center in Virginia. It was flown to Kennedy Space Center by C-5 transport and was the last piece of hardware stacked onto the rocket in the Vehicle Assembly Building. Ares I-X used avionics hardware from the Atlas V Evolved Expendable Launch Vehicle (EELV) to control its flight. This hardware included the Fault Tolerant Inertial Navigation Unit (FTINU) and Redundant Rate Gyro Units (RRGUs), and cable harnesses. The first stage was controlled primarily by heritage hardware from existing Space Shuttle systems. A new electronics box, the Ascent Thrust Vector Controller (ATVC), acted as a translation tool to communicate commands from the Atlas-based flight computer to the solid rocket booster's thrust vector control system. The ATVC was the only new avionics box for the flight. All other components were existing or off-the-shelf units. Ares I-X also employed 720 thermal, acceleration, acoustic, and vibration sensors as part of its developmental flight instrumentation (DFI) to collect the data necessary for the mission. Some of this data was transmitted real-time via telemetry while the rest was stored in electronics boxes located in the First Stage Avionics Module (FSAM), located inside the hollow first-stage fifth segment. The ground-based portion of the mission's avionics included a ground control, command, and communications (GC3) unit, which was installed on Mobile Launcher Platform No. 1 (MLP-1) for launch at Launch Complex 39B at Kennedy Space Center. The GC3 unit enabled the flight control system to interface with computers on the ground. The flight test vehicle flew autonomously and was controlled by the FTINU, located on the underside of the lower ballast plates of the upper-stage simulator (USS). The avionics were developed by Lockheed-Martin of Denver, Colorado, a subcontractor to Jacobs Engineering of Huntsville, Alabama, and is managed by Marshall Space Flight Center in Huntsville, Alabama. Three DVDs with 60-second home videos recorded by the public and submitted through NASA's website. 3,500 flags to be distributed to Ares I-X team members. A new, taller lightning protection system for Launch Complex 39B, which is taller than the existing tower used for Space Shuttle operations. A new Mobile Launch (ML) gantry was constructed using universal connectors to allow commercial vehicles to launch using ML. ML was used in the test flight. A platform inside the Vehicle Assembly Building was removed to allow the Ares I-X vehicle to fit and roll out. A new vehicle stabilization system (VSS), which kept the vehicle from swaying on the launch pad after rollout. The VSS uses off-the-shelf hydraulic shock absorbers from the Monroe division of Tenneco, Inc.
Environmental control systems (ECS) regulated temperatures inside the VSS and fifth segment simulator to keep the avionics and ground crew cool. The ECS interfaces to the rocket are “T-0” units, meaning they disconnected from the launch vehicle automatically when the countdown reached zero. Ground operations and ground systems were handled by United Space Alliance and NASA personnel at Kennedy Space Center. The Ares I-X Systems Engineering & Integration (SE&I) Office, managed by the NASA Langley Research Center, was responsible for integrating the vehicle's parts into a complete rocket and making sure they work together as a system to meet flight test objectives. SE&I was responsible for ensuring all components functioned collectively to satisfy primary and secondary mission objectives. Detailed management of system interfaces, mission level requirements, validation plans, and flight instrumentation management were key SE&I contributions. SE&I provided the structural, thermal and aerodynamic analyses for the overall system to allow the components to be designed and built. SE&I also managed the mass of the vehicle and developed the trajectory and the guidance, navigation, and control algorithms used for vehicle flight. To complete these tasks, wind tunnel testing and computational fluid dynamics (CFD) were used to investigate forces acting on the vehicle in various phases of flight, including lift-off, ascent, stage separation and descent. Once the basic design was understood SE&I provided structural analyses for the system to assure the rocket would behave properly once it was integrated. Schedule development, management and control was provided by ATK Schedule Analysts permanently located at the NASA Langley Research Center working through the TEAMS contract agreement between ATK and NASA Langley. Ares I-X launches from LC-39B, 15:30 UTC, October 28, 2009. The dramatic yaw maneuver to clear the launch tower is evident in the photo. Ares I-X had been scheduled for launch on October 27, 2009, the 48th anniversary of the first Saturn I launch. The launch attempt was delayed due to weather plus other last-minute concerns. The ground crew experienced difficulty removing a protective cover from an important nose-mounted five-port sensor package. A private watercraft had blundered into the restricted downrange safety zone and had to be chased away. Launching through the day's high cirrus clouds could have caused triboelectrification, potentially interfering with range safety communication and hampering the RSO's ability to issue the self-destruction command. Launch Director Ed Mango repeatedly delayed resumption of the countdown from the planned hold point at T-00:04:00. Ultimately, constraints of the 4-hour launch window, coupled with high clouds and other last-minute concerns, caused the mission to be scrubbed for the day at 15:20 UTC on October 27, 2009. Launch was rescheduled for a four-hour window opening at 12:00 UTC on October 28, 2009. Ares I-X launched on October 28, 2009 at 11:30 EDT (15:30 UTC) from Kennedy Space Center LC-39B, successfully completing a brief test flight. The vehicle's first stage ignited at T-0 seconds and Ares I-X lifted off from Launch Complex 39B. The first stage separated from the upper-stage simulator and parachuted into the Atlantic Ocean roughly 150 miles (240 km) downrange of the launch site. The maximum altitude of the rocket was not immediately known, but had been expected to be 28 miles (45 km). The launch accomplished all primary test objectives, and many lessons were learned in preparing and launching a new vehicle from Kennedy Space Center. Prior to the flight there had been some concern among NASA scientists and among Ares critics and skeptics that the thrust oscillation would prove too violent for human astronauts to safely ride an Ares rocket. NASA Watch revealed that the first-stage solid rocket booster of the Ares I could create high vibrations during the first few minutes of ascent. The vibrations are caused by sudden acceleration pulses due to thrust oscillations inside the first stage. NASA admitted that this problem is very severe, rating it four out of five on a risk scale. NASA was very confident it could solve the problem, referring to a long history of successful problem solving. NASA officials had known about the problem since fall 2007, stating in a press release that they had wanted to solve it by March 2008. According to NASA, analysis of the data and telemetry from the Ares I-X flight showed that vibrations from thrust oscillation were within the normal range for a Space Shuttle flight. Approximately two hours after launch of Ares I-X, safing crews entering pad LC-39B reported a small cloud of residual nitrogen tetroxide leaking from an obsolete shuttle oxidizer line at the 95-foot (29 m)-level of the Fixed Service Structure, where it connects to the Rotating Service Structure. At 8:40 am on October 29, 2009, a hydrazine leak was detected on the 95-foot (29 m)-level, between the Payload Changeout Room and the Fixed Service Structure. Both leaks were capped without injury. Due to the Pad Avoidance Maneuver performed by Ares I-X, shortly after liftoff, the Fixed Service Structure at LC-39B received significantly more direct rocket exhaust than occurs during a normal Space Shuttle launch. The resulting damage was reported as "substantial," with both pad elevators rendered inoperable, all communication lines between the pad and launch control destroyed and all outdoor megaphones melted. The vehicle-facing portions of the Fixed Service Structure appear to have suffered extreme heat damage and scorching, as do the hinge columns supporting the Rotating Service Structure. This damage was anticipated as NASA intended to remove the FSS and launch future Ares flights from a "clean pad". During the flight, a pyrotechnic charge on the reefer, which holds the chute together, was set off early while still inside the parachute, causing the parachute to overload and fail on deployment. The added stress on the second parachute caused it to overload and partially fail as well. The two remaining parachutes guided the booster to a rough landing, but it luckily sustained minimal damage. The parachute lanyard design was changed as well to prevent repeat incidents. According to NASA, partial parachute failures were not uncommon in Space Shuttle Solid Rocket Boosters, from which the Ares I-X is derived. Eleven partial parachute failures occurred on Space Shuttle SRBs, including on STS-128. A portion of the large dent in the first-stage lower segment, as photographed by divers from the recovery vessel MV Freedom Star. The first stage was found floating upright, as is typical of expended Space Shuttle Solid Rocket Boosters. However, recovery divers noted buckling of the lower portion. Reports also note an apparent fracture of the booster's forward segment casing and a fractured bracket that held an actuator, part of the SRM's nozzle vectoring system. A NASA memo states that engineers believe that the lower segment buckled when the first stage landed at a much higher speed than designed as a result of one of three main parachutes failing to deploy, as well as the failure of a second main parachute to remain deployed. It is unclear, at this point, what caused the apparent casing fracture and broken bracket, and NASA has not commented on this damage. The unpowered Upper Stage Simulator (USS), which was not meant to be retrieved, impacted further out into the Atlantic Ocean. The USS began to tumble, in a flat, counterclockwise spin almost immediately after staging. After initial concerns that the motion might have been caused by a collision between the USS and the first stage, further analysis showed that no actual recontact happened and that the tumble had been one of the possible behaviours predicted by pre-flight simulations. The USS was not a precise match to the characteristics of a real Ares I upper stage, and was not intended to test the upper stage's independent performance. The fact that the upper stage was not powered, and separated at a lower altitude than the real upper stage would on the final Ares I, contributed to the spin. Mission managers watch the launch. ^ Karlgaard, Christopher D.; Beck, Roger E.; Derry, Stephen D.; Brandon, Jay M.; Starr, Brett R.; Tartabini, Paul V.; Olds, Aaron D. "Ares I-X Best Estimated Trajectory and Comparison with Pre-Flight Predictions". American Institute of Aeronautics and Astronautics. hdl:2060/20110014643. ^ Tarpley, Ashley F.; Starr, Brett R.; Tartabini, Paul V.; Craig, A. Scott; Merry, Carl M.; Brewer, Joan D.; Davis, Jerel G.; Dulski, Matthew B.; Gimenez, Adrian; Barron, M. Kyle. "Ares I-X Range Safety Trajectory Analyses Overview and Independent Validation and Verification". NASA. hdl:2060/20110014362. ^ Harwood, William (2009-10-20). "Ares I-X rocket hauled to launch pad for critical test flight | The Space Shot – CNET News". News.cnet.com. Retrieved 2011-03-01. ^ Operational Lessons Learned from the Ares I-X Flight Test (PDF), NASA, retrieved February 1, 2012 . ^ "NASA – NASA's Ares I-X Rocket". Nasa.gov. ^ a b c d e f g "Arex Flight Test Vehicle Integration Map" (PDF). NASA. ^ "The Flame Trench | Florida Today's Space Team Blog". floridatoday.com. 2009-02-23. ^ "Ares I-X Press Kit" (PDF). NASA. October 2009. Archived from the original (PDF) on 2010-01-06. ^ "Ares I-X Upper Stage Simulator at NASA Glenn revealed | Metro - cleveland.com". Blog.cleveland.com. 2008-03-13. ^ "Teledyne Brown Ships Ares I-X Hardware | SpaceRef – Your Space Reference". SpaceRef. Archived from the original on 2012-09-10. ^ "NASA a Step Closer to First Flight Test of Next Crew Launch Vehicle". Reuters. January 22, 2009. Archived from the original on May 22, 2009. ^ Robert Z. Pearlman (October 26, 2009). "NASA's Ares I-X to fly on historic hardware with commemorative payload". collectSPACE.com. ^ "NASA scrubs launch of Ares I-X rocket". CNN. 2009-10-27. ^ "In a critical step before launch, technicians remove a protective cover from the Ares I-X nose sensors". NASA. Archived from the original on June 8, 2011. Retrieved 2009-10-29. ^ User scottrainey: I was there that day, touring the Kennedy Space Center, hoping to see the launch. This issue and the others listed, was broadcast over the KSC PA system. ^ a b Philman, Amber (2009-10-27). "NASA's Ares I-X Launch Rescheduled for Wednesday" (Press release). NASA. ^ Kanigan, Dan (2009-10-27). "Flight Rules and Triboelectrification (What the Heck is That?)". NASA Ares I blog. 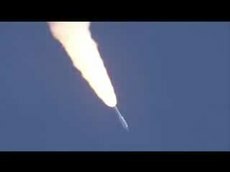 ^ "NASA – Ares 1-X Flight Test Launch Blog". Nasa.gov. 2009-10-26. ^ Tartabini, Paul V.; Starr, Brett R. "Ares I-X Separation and Reentry Trajectory Analyses". American Institute of Aeronautics and Astronautics. hdl:2060/20110014618. ^ Chris Bergin (October 31, 2009), Pad 39B suffers substantial damage from Ares I-X launch – Parachute update, NASA Spaceflight.com, retrieved February 1, 2012 . ^ Stephan R. Davis, Operational Lessons Learned from the Ares I-X Flight Test (PDF), American Institute of Aeronautics and Astronautics, retrieved February 1, 2012 . ^ a b Carreau, Mark (January 19, 2008). "Severe vibration problem plagues moon rocket design". Houston Chronicle. Retrieved August 5, 2009. ^ Cowing, Keith (January 17, 2008). "NASA's Exploration Systems Mission Directorate Responds to Ares 1 and Orion Questions". NASA Watch. Retrieved August 5, 2009. ^ Halvorson, Todd (2009-10-29). "Live At KSC: Pad Evacuated After Propellant Leak". Floridatoday.com. ^ a b Bergin, Chris (2009-10-31). "Pad 39B suffers substantial damage from Ares I-X launch – Parachute update". NASASpaceFlight.com. ^ Harwood, William (2009-10-29). "NASA assessing parachutes and dented Ares 1-X booster". Spaceflightnow.com. ^ a b Halvorson, Todd (2009-10-29). "Live At KSC: Ares I-X Parachutes Fail During Flight". Floridatoday.com. ^ Dunn, Marcia (2009-10-27). "NASA's new moon rocket makes first test flight". Associated Press. Archived from the original on 2013-01-02. ^ "Re: LIVE: Ares I-X Countdown and Launch ATTEMPT 2 Updates". NASAspaceflight.com. 2009-10-28. ^ Clark, Stephen (2009-10-30). "Parachute failure causes damage to Ares 1-X booster". Spaceflightnow.com. Wikimedia Commons has media related to Ares I-X. "About the Ares I-X Rocket". nasa.gov. "Glenn Provides Key Support for Ares I-1 Flight Test". nasa.gov. "Kennedy Space Center to become a moonport again". spaceflightnow.com.